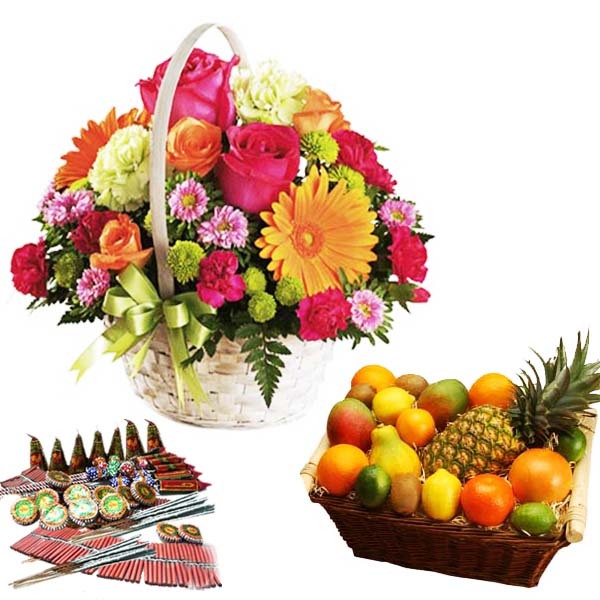 Product Consist : Basket of 15 Seasonal flowers like Roses Gerberas Carnations with green fillers and 5 Kg Mix Seasonal Fruits in Basket along with Assorted Fire crackers (Worth Rs.300/-) (Note: Types of Fire Cracker are depends upon their availability no specific choice). 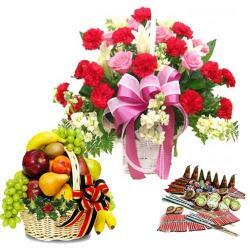 Present a smile to anyone who is close to your heart with a spectacularly floral arranged basket15 seasonal flowers like roses gerberas carnations that are in different and bright shades are sure to attract anyone after they are received on the doorsteps. 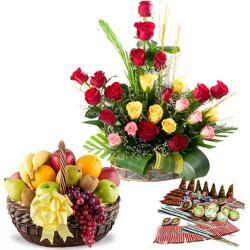 surprise your dear one with fresh juicy fruits in basket along with assorted firecrackers. 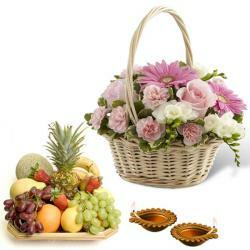 This hamper becomes even more desirable for anyone. 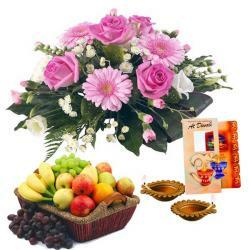 The Diwali greeting is perfect to express your heart felt emotions for anyone.Product Includes: Basket of 15 Seasonal flowers like Roses Gerberas Carnations with green fillers and 5 Kg Mix Seasonal Fruits in Basket along with Assorted Fire crackers (Worth Rs.300/-) (Note: Types of Fire Cracker are depends upon their availability no specific choice).